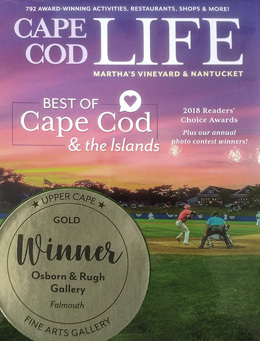 Cape Cod Life Magazine reader's voted to award the gold medal for best fine art gallery on the Upper Cape to the Osborn & Rugh Gallery. "In Plein Air - Osborn & Rugh", a short film my Manx Magyar, Sandwich TV, Spring 2017. 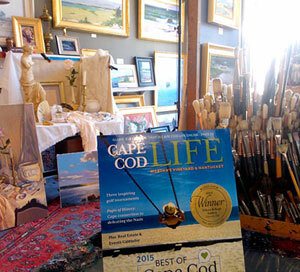 Article featuring Hillary Osborn & Doug Rugh, Cape Cod Times - SpringTimes Magazine 2017. 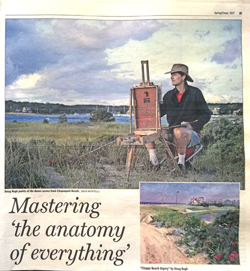 "Mastering 'the anatomy of everything'", pages: 29-33. NOTE: The gallery is a working studio and is often open before and after regular hours and often on closed days. Visit by chance when the flag is out or make an appointment for a time of your convenience. 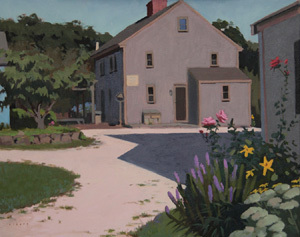 If you are visiting Martha's Vineyard and would like to see the gallery during off hours on your way to or from the ferry in Woods Hole please contact either artist for an appointment. 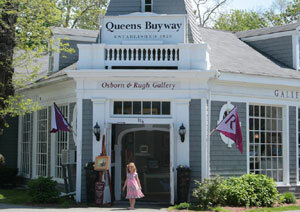 The gallery is located at the historic shopping area of Queen's Buyway in Falmouth, MA (on the corner next to Coffee Obsession). Parking is available across the street next to the Corner Cycle bike shop or in the inner courtyard area behind the Queen's Buyway shops. Both artists create landscapes from the surrounding areas through the outdoor season and work up larger studio paintings in the gallery. Because it is an artist-run gallery the painters are able to work directly with clients to create custom made paintings of favorite subjects to fit a specific spot in the home or office. 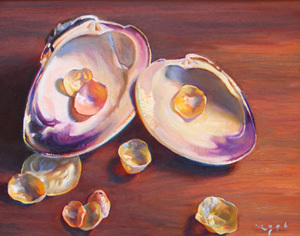 Clients often pick a smaller painting from those on display. Rugh also accepts portrait commissions and reference photos can be taken in a few minutes under controlled lighting in the studio. 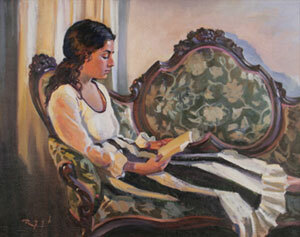 Clients may also elect to sit for some of the painting or have portraits done at a favorite location, indoors or out. 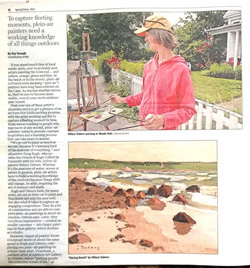 Hillary Osborn's and Doug Rugh's studio/gallery is in Falmouth, MA on Cape Cod surrounded by an endless source of inspiration for landscape painting. The artists prefer to paint in the field and believe that spending hours in a location under changing conditions is the best way to study atmospheric effects that take place in nature. A painting is not a snapshot copied dab for dab from a photograph but a collection of observations enhanced by: perception of an infinite number of tones; a sensitivity to color temperature; the observation of chromatic pure colors and direct observation of depth and three-dimensional texture -- all aspects specific to the genre and a technical command of which is necessary to create a sense of place. 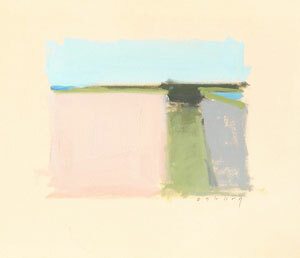 Small to mid-size paintings are created on location with a concentration on observation and study of the landscape: the quality of light, the mood and the time of day. These are then brought back into the studio to create larger works in which formal and aesthetic decisions are brought to bear on the final painting. From years of working in the field the artists have built up a library of mental images to draw from that will enhance compositions when they are completed in the studio. In essence, the process begins with the scientific and ends with the artistic. 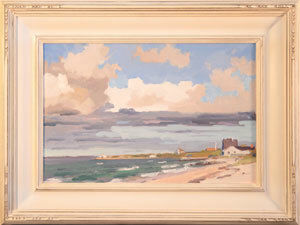 Paintings are priced by size and include framing. Please contact the artists to receive a price list. 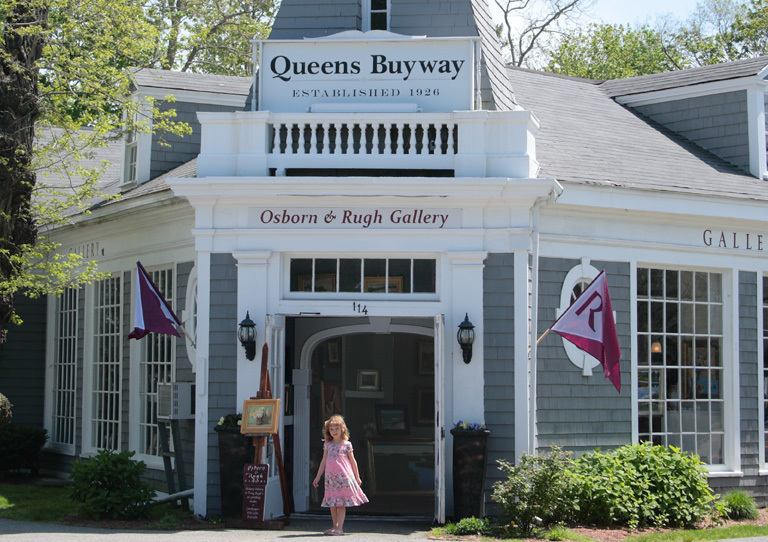 At the spot where Route 28 turns sharply toward the Village Green stands the Queens Buway, a vintage shopping area where a faux lighthouse beckons buyers and browsers into Falmouth's business district. Once a Filene's store, the flagship building at 114 Palmer Avenue has since 2008 been home to the Osborn & Rugh Gallery. Its walls of more than 200 windows shed light on a collection of paintings hung layers-deep, poised to emphasize the beauty, volume and variety of works created by husband and wife artists Doug Rugh and Hillary Osborn. 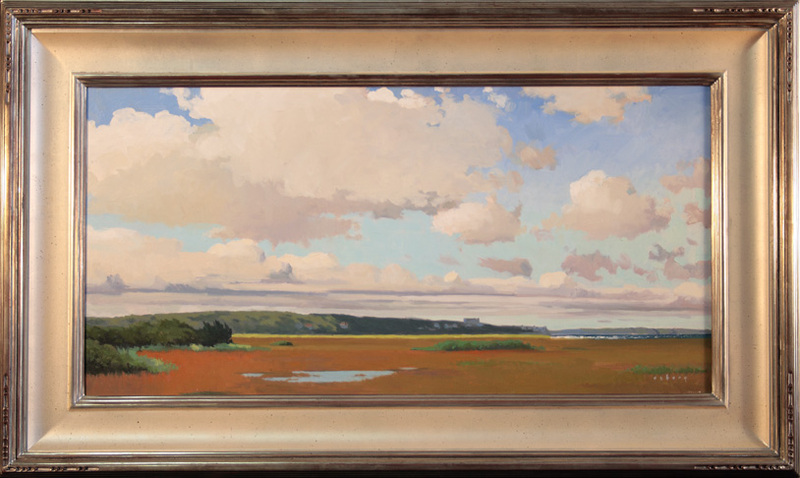 First to catch the eye are scores of Cape Cod views the pair have captured on location: summery beach scenes, tranquil harbors, vibrant renditions of blossoming plant life. Next to claim attention are still lifes rendered in a stately classical realism. 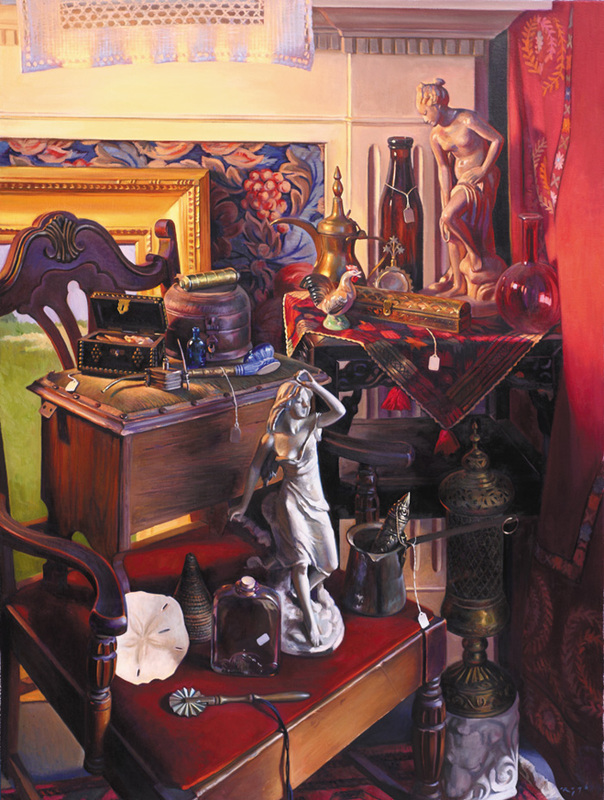 Figurative paintings of models and neighbors coexist with pieces commissioned by clients seeking to crown their mantels with favorite vistas or family likenesses. Some of those personal images are modern and casual, while others show formally dressee children in settings worthy of a John Singer Sargent family portrait. Bright spacious and accessible, the gallery also serves as a working studio where patrons come to witness the creative process, seek advice on collecting, and collaborate on ideas for commissioned work. 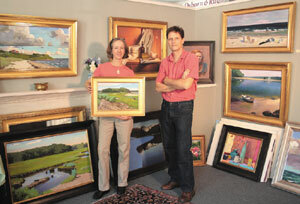 Osborn & Rugh deals exclusively in the two artists' own one-of-a-kind oil paintings--no reproductions here. 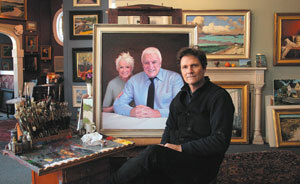 For the entry-livel collector, the couple offers small-scale paintings that begin at $500; most mid-sized oils sell in the $2,000 to $3,000 range, while the cost of a large commissioned portrait may to $20,000. Despite long roots in the Falmouth area--Mr. Rugh's grandfathers were Marine Biological Laboratory sientists, and Ms. Osborn descends from whalers from Martha's Vineyard--the two fledged their artistic wings elsewhere. 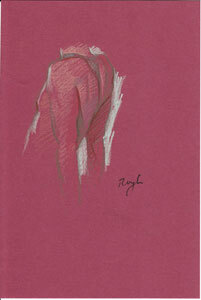 The huysband, raised in a diplomatic corps family in the Middle East, attended Maryland Instititue College of Art before earning a bachelelor of fine arts degree at Rhode Island School of Design, while his spouse, reared in Franklin, holds a master of fine arts degree from the University of North Carolina at Greensboro and attended the New York Studio School. Both are members of the distinguished Copley Society of Boston, where Mr. Rugh attained the top rank of Copley Master. Surveying the dazzling inventory at hand, Ms. Osborn explained, "We did not start out like this. What you see here is our life's work." Added Mr. Rugh, "We just keep painting. If a work is good, the right person will eventually come in and buy it." 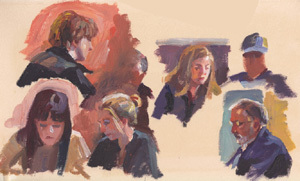 Classes are held October through May. Private lessons with Hillary Osborn are $90 per hour. Two-hour sessions are recommended. 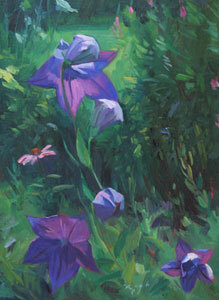 These may be outdoors painting from the landscape or indoors painting from the still life. Semi-private lessons are $70 per hour and usually include 3 - 4 students. Sign up with a friend. 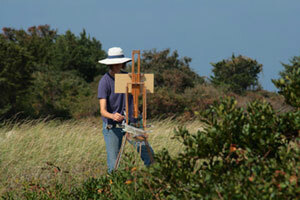 Hillary also teaches landscape painting workshops on location in the immediate area. Contact her to be put on the mailing list. Contact Hillary to sign up - for more info - or to be put on the email notification list as space becomes available. It works just like cash. 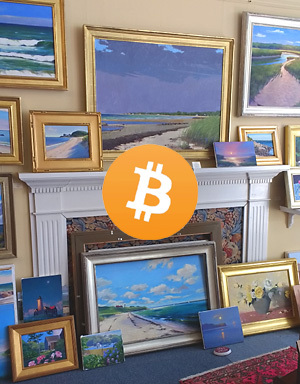 Please let us know if you would like to purchase framed oil paintings with bitcoin (includes shipping).